Okay, gang, JOHN LOGAN: FOUR IN THE CHAMBER has arrived. The first four John Logan novels in one book has hit the shelves! Here is the press release from ProSe Publishing! Hey, gang, Part III of the Eastlander Chronicles continues to trek along. It's going to be a good finish to this story. I got the idea for Cain and his black sword while I was stationed at Ft Leonard Wood, MO. The original thesis of Cain chasing Nyogi was there from the beginning and I'm finally glad to be able to get it out there. When Part III is done, I have plans to submit it to my publisher for them to consolidate all three stories into one volume. With their talented team behind me, I think it will be a treat to get all three together in one. HINDSIGHT, the new Logan novel has a scheduled release date of June 2015. I'm already on the editing and revising phase of the project. ProSe is working to create an Omnibus of the first four John Logan novels. That's right, the first four books in one volume. I will keep you informed how things are coming along and when you can expect it to hit the shelves. HINDSIGHT, the newest Logan novel, is due out in 2015. Again, I'll keep you up too date. Personally, things are fine. Have been active in my church, work is going full bore as usual, and the domestic front is never boring. My wife has recuperated from a broken ankle so I'm glad to have her back on both solid feet again. 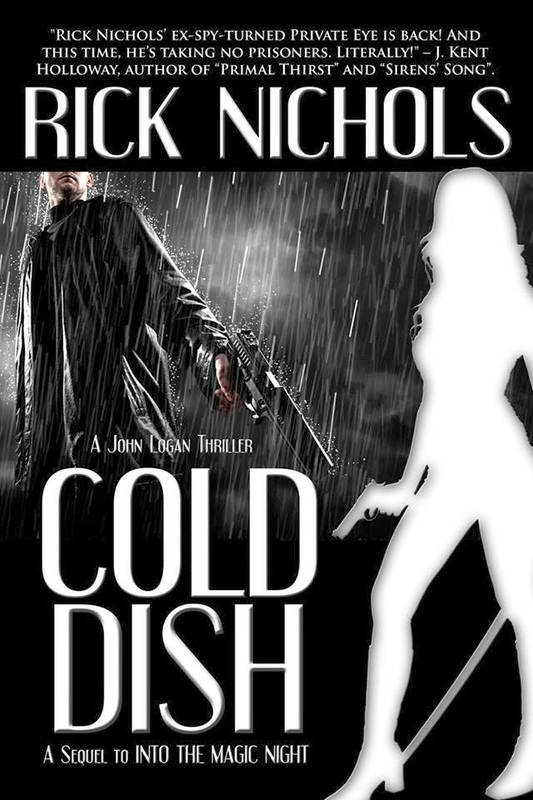 As many of you know, COLD DISH was published through my new publisher, ProSe. The previous four Logan novels were through Seven Realms, which is no longer carrying my books on their website. I am in the process of securing everything needed for ProSe to take over the entire John Logan catalog; in the meantime, if you order one of the first four in the series and they are out of stock, I sincerely apologize. I am working to get them back on the market as soon as possible. I am told that Amazon still has a few copies in their inventory so I'm hoping that there will not be a long disruption in availability. Again, my apologies for any future inconvenience and I will make sure you get the announcement when the ProSe has them available. There is nothing as intimidating as writer's block. Rick, do you mean you get blocked at times? Oh, yeah, baby, I get blocked and I've spent the last several weeks banging my head against the dreaded blank screen. It happens to me once in a while, especially after I've finished a novel. It's happened before and it will happen again. Well, nothing beats sitting down and just writing something, some scene, some story, anything. Many times it's crap and you know it's crap but it helps to get the juices flowing. Some say it's because of the death of my mom that's got me all messed up, but I was blocked before she passed so I can't use that excuse. All I know is last night I sat down with the determination to start #3 of the Eastlander Chronicles and lo, it happened. All is back on track with Rick now. By the way, The next Logan novel should be out in 2015. HINDSIGHT is a good one and I can't wait for you to read it. It was not a big shock; she'd been in failing health for several years and my brother and I knew the end was coming soon. I rushed home, driving 700 miles in a downpour that had soaked the East Coast. She passed away before I got there. I suppose that most everyone thinks their mom is the best one. I know I certainly had a good one. Gentle and soft spoken with the courage and inner strength of a thousand lions, she became a widow at 49 and worked two jobs for 25 years to keep busy and provide for us. She was a woman of simple tastes, never going for the fancy stuff in life. She never used a computer, never had a cell phone, and her greatest joy was telling people about her grandchildren. She was a woman of faith and she passed that faith onto her two boys. Today I saw a video of a guy who lost 140 pounds in 10 months. (It's on You tube if you want to watch it, but you might want to bring some tissues). He had bad knees, a bad back, and walked with the help of 2 canes. Doctors said he would never walk unaided again. One yoga instructor believed in him and through sheer guts and determination he started trying yoga, falling down and getting back up. Now he's walking and running! We have no excuses, gang. Whether it's losing weight (I'm trying to lose 10 pounds) or writing that novel or going back to school, there is simply no excuses. If Helen Keller can graduate college without being able to see or hear, if Seaworld can teach a fish to shoot a basketball, what's your excuse? What is mine? Fear? Usually. Fear of failure. This man in the video failed. He fell and fell and fell and he got back up. Maybe he was at that point where he had nothing to lose even if he failed. Sometimes you get to that point. COLD DISH HAS ARRIVED. Pro Se announced the release of COLD DISH on their website and through press releases last night. With his home in ruins, his lover in a coma, and his best friend missing, John Logan finds himself injured, alone, and fighting to protect an innocent witness while he works to uncover the truth behind the bombing that has shaken his world. His search will uncover an old familiar killer, a man whose money and power seems endless. It will take all of Logan’s skill and determination to survive. For how does someone who has nothing fight a man who has everything? As I announced last week, I have a new publisher. Pro Se Productions will be handling the John Logan series beginning with COLD DISH and will also handle some of my upcoming projects I think. Tommy Hancock and the rest of the Pro Se team have been fantastic in welcoming me and I look forward to many years with them.